CMDB Sync | Qualys, Inc.
Synchronize asset information from Qualys into ServiceNow CMDB. 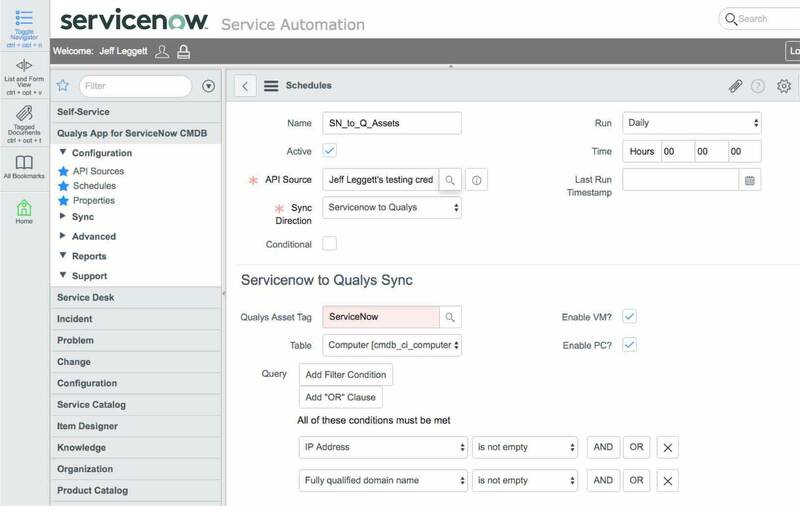 Qualys SYN complements ServiceNow CMDB with detailed data on new and changed IT assets. The data comes from Qualys’ Asset Inventory application which leverages Qualys’ highly distributed and scalable cloud platform, and various data collection tools, including Qualys’ groundbreaking Cloud Agents, to compile and continually update a full inventory of your IT assets everywhere: on premises, in elastic clouds and mobile endpoints. The Asset Inventory data that Qualys SYN feeds to ServiceNow CMDB gives you a complete, multidimensional view of each asset, including system, security and compliance information. For example, the asset data can include hardware specs such as manufacturer, model, CPU, memory and disk space as well as software data such as software name, version and vendor. Qualys SYN eliminates unidentified and misclassified assets, as well as data update delays, all of which increase the chances of security breaches. The app gives you real-time, comprehensive visibility into your IT asset inventory so you can flag security and compliance risks immediately. Asset changes are immediately detected by Qualys and synchronized with ServiceNow. Qualys SYN supports multiple Qualys accounts and API sources, and lets you configure and save synchronization schedules. As required by ServiceNow, changes to ServiceNow CMDB are staged for user approval before being written to the CMDB. SYN also generates preconfigured reports, such as Qualys asset tags by source, assets tag distribution, and OS distribution. A transform map is a set of field maps that determine the relationships between fields in an import set and fields in an existing ServiceNow table. After creating one, you can reuse it to map data from another import set to the same ServiceNow table. The Transform Maps module lets administrators define destinations for imported data on any ServiceNow tables. Preconfigured table transform maps for open ports, assets, network interfaces, software, processors and volumes.